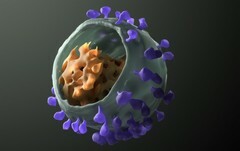 Three-dimensional model of Simian Immunodeficiency Virus (SIV) derived from cryo-electron tomography data. SIV is a homologue of the human immunodeficiency virus (HIV) that infects monkeys. It is very similar in structure and function to HIV. The virus features surface spikes (purple), membrane (green), and core material (orange).